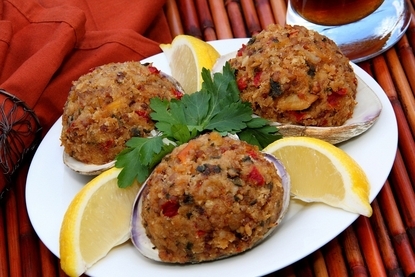 Our Quahog (pronounced) "Kwaw Hawg" Stuffies are an Ole'Fashioned New England treat! We take big ole' clams, shuck 'em, mix ' em with seasoned bread crumbs, clam juice, and spices and put it back in the shell ready to bake! Just heat, add a squirt of lemon, and maybe a shot of hot sauce and you are good to go! Order These Great Stuffies By 10am EST, And Enjoy It For Dinner Tomorrow! Our Appetizers Also Make A Great Gift Idea For Your Favorite Seafood Lover! How Easy Is That! Growing up back east, you cannot get good quality "stuffies" anywhere near here, and trying to get all the stuff to make them is really not possible. I cannot begin to tell you how good these are! If you want real clams, and qwahogs as we call them back home in your stuffies, then these are by far the best. No filler and a few clams here, these are the REAL DEAL! Great job and great recipe Capt! We will be ordering more! THE BEST STUFFED CLAMS EVER! I have to tell you these are the best I have ever had, and that is saying a lot! You guys gotta try these things! I'm very impressed with how awesome they came out. Reminded me of back home! If I could give them 6 claws, I would!! just like home. glad we found your site! I could eat about 10 of theses things! They are really great, and just like we used to have back east! Great product Tim, keep up the good work.